Chevy embedded digital video ads in print versions of Esquire and Popular Mechanics magazines. Don’t ask me how the technology works – because I have absolutely no idea – but Chevrolet installed digital video players into the May print issues of Esquire and Popular Mechanics. 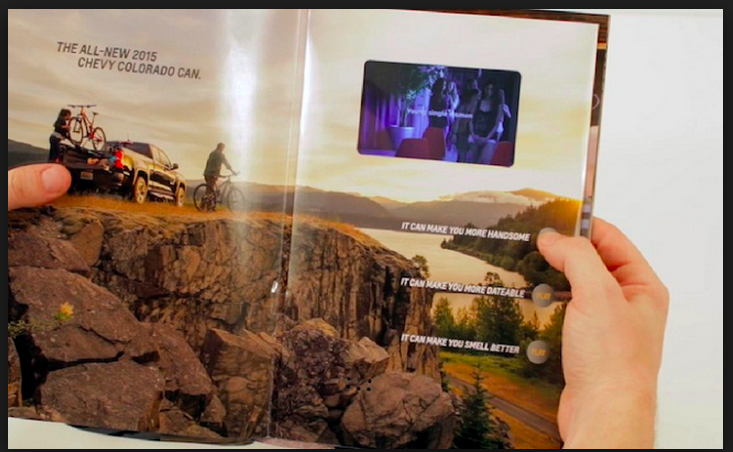 The ads for Chevy’s Colorado line of pickup trucks allow readers to watch three short videos, right from the pages of the magazine. Chevy targeted the ads to approximately 20,000 subscribers that the company felt were the most likely to purchase a Colorado truck. Seeing as a Chevy representative openly admitted that “the unit is obviously expensive,” the brand combed through every bit of consumer data they could find, in order to determine who got the video ads. This marks just the second time a magazine has embedded videos into print editions. In 2009, CBS ran a video ad for their fall programming lineup in Entertainment Weekly, thanks to technology from Americhip – the same company Chevy used for their magazine spots. Stories about the oncoming death of print media are a dime a dozen these days. Clever technological developments like this one could lend a hand in keeping the print magazine relevant to youthful consumers.